The installation of flat top metal railings has provided a secure boundary as part of a £3m project to expand the campus of St Johns Roman Catholic School in Kent. Located in Gravesend, close to the banks of the River Thames stands St Johns Roman Catholic Primary School. The school has recently undergone a £3m redevelopment to expand it from a 3-form entry (90 children) to 4 form entry school capable of educating 120 children per year group. Plans for the development were approved by the Diocese of Southwark and Kent County Council, with the works to be carried out over 3 phases by Kier Construction. Funding for the expansion has been provided entirely by Kent County Council. Phase 1 started in the summer of 2017 and has provided three new classrooms and a new studio. Phase 2 consists of a further seven classrooms being added, a new staff room and small hall. Phase 2 will also include the construction of two new playgrounds on the playing field at the rear of the school. The remaining phases of work will be completed by September 2019. As part of the Phase 2 works, Alpha Rail was contracted by Cablesheer Group to manufacture and install flat top metal railings to provide a perimeter boundary around the school. 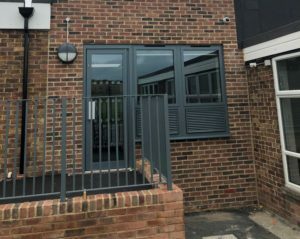 In total 13.8 linear metres of 1200W x 1100H Flat Top metal railings were supplied, galvanised and polyester powder coated RAL 7031 “Blue Grey” to match the school uniform colours. If you have a project that requires metal railings and gates, please call us on 01623 750 214 or get in touch via email at websales@alpharail.co.uk. To view other projects where have installed flat top metal railings, please visit our Project Library.